Summary and Definition: Populism is the political doctrine (belief) that supports the rights and powers of the common working people in their struggle with the privileged and influential elite. Populism in America was the movement to increase the political power of farmers and laborers and to work for legislation in their interest. In the early 1890s a coalition of farmers and laborers, supported by middle class activists founded an independent political party called the People's Party which also known as the Populist Party. This article contain brief, fast facts about the history of Populism and its legacy in America. Populism in America had its roots in America's first national farm organization called the National Grange of the Patrons of Husbandry. The association was founded by Oliver H. Kelley in 1867 and became known as the Granger Movement. The Granger Movement was initially formed mainly for social purposes, to help alleviate the isolation felt by farmers. The Grangers goals were to change due to the economic situation and the Rise of Big Business and Corporations owned by greedy and ruthless Robber Barons who monopolized the main industries in America, including the railroads during the period in American history known as the Gilded Age. The livelihoods of the farm workers in the country areas were effected when the powerful railroad companies gained a monopoly on the Grain Elevators, used for loading grains transported from local farms via the railroad to distant markets. The Grain elevator operators bought the farmers produce and then sold the crops on at inflated prices, accumulating large profits. The Grain Elevator operators, employed by the railroad magnates used their purchasing power to control prices of crops. The picture depicts the power of the railroads and the Robber Barons and the effects on the farmers. The train has the words "Depression", "Bribery" and "Extortion" on the cars that are moving on an unstoppable railroad track towards farmers being crushed by the power of the railroads. A clear representation for the rise of Populism in America. Populism in America was a political strategy that strongly appealed to the interests of ordinary, working class people. Populism supported the rights and powers of the common working people in their struggle with the powerful, wealthy and privileged Robber Barons. Populism in America sparked the movement to increase the political power of farmers and laborers and to work for legislation in their interest against the bankers and the railroad magnates. The Panic of 1873, also referred to as the Long Depression, saw the rise of Populism in America. The Panic of 1873 was a serious financial crisis that triggered a depression in America that lasted for 6 years and lead to economic hardships, civil unrest, protests and the first nationwide strikes. Membership of the Granger movement dramatically increased following the Panic of 1873. The farmers were helpless against the falling crop prices, triggered by increased production. There was a reduction in the money supply, rates of interest on loans soared and tariffs (taxes) increased. 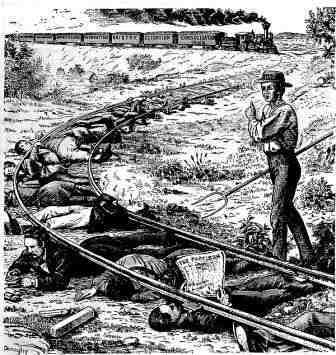 The small farmers were completely obstructed by the railroad monopolies and ever increasing transportation costs. By 1874 the Granger Movement had over 1 million members, most of whom adhered to the new idea and principles of Populism realizing that political action was required to improve their dire situation. The failure of the new tactics resulted in the demise of the Granger Movement and its members started to join other organizations who adhered to Populism in America and the Farmers’ Alliance was formed in 1877. The black farmers formed the Colored Farmers' National Alliance and Cooperative Union in 1886 which strongly supported the doctrine of Black Populism. The Black Populists organized their communities and extended their goals to fight against the infamous Jim Crow laws that enforced Populism in America. Other members of the Farmers Alliance wanted to form a third political party. Collective action was called for and in December, 1890, members of the Farmers' Alliance and Industrial Union met together in the Marion Opera House in Ocala, Florida, where they adopted the more radical Ocala Demands. The grievances of the farmers and their support of Populism reached a new height in 1890 when the McKinley Tariff was passed by Congress. The McKinley Tariff was particularly harmful to southern and western farmers who sold their crops on unprotected markets, but were forced to buy expensive manufactured goods. The backlash from the farmers resulted in furious protests and the farmers helped vote Republicans out of the House of Representatives in the 1890 congressional elections. They also became more politically ambitious and wanted to push for political and economic reforms which gave rise to the formation of the Populist Party. "...to restore the government of the Republic to the hands of the plain people, with which class it originated"
● A "safe, sound, and flexible" national currency with "the free and unlimited coinage of silver"
The Omaha platform denounced the government’s refusal to coin silver as a "vast conspiracy against mankind." and called for a return to unlimited coinage of silver to increase the money supply. The following year, amidst all the turmoil, the unthinkable happened. There was another financial crash caused by the Panic of 1893. The Panic of 1893 was a serious financial crisis that a Wall Street crash triggering a 4 year depression that led to terrible hardships as the national unemployment rate approached 20%. Major banks collapsed, ruined by over speculation of the Philadelphia & Reading Railroad leading to foreclosures and bankruptcies. 125 railroads went into receivership. The 1890 Sherman Silver Purchase Act had enabled the Treasury to issued dollars backed by silver, as well as gold. The dollar lost its value and the devalued US currency had a disastrous effect on the nation's farmers who were unable to obtain low-interest credit to sustain their businesses. Farmers could not raise grain prices and thousands of farmers lost their homes and their lands. The terrible working conditions, combined with poverty and squalid living conditions, led to protests and strikes. In 1894, Ohio businessman Jacob S. Coxey had led 500 men "Coxey’s Army" in a march to Washington, D.C., to petition the government for cheap money and debt-relief programs - but they were all arrested fro trespassing on the lawn of the White House. Nearly 1 million workers went on strike. The most notable was the nationwide 1894 Pullman Strike which ended when railroad owner George Pullman and the other railroad magnates gained the support of President Cleveland who sent in US troops who used harsh methods to suppress the strikers. The appalling living and working conditions led to many Progressive activists and the creation of the Progressive Movement which gave rise to the many social and political Progressive Reforms. Another serious consequence of Panic of 1893 was a crisis for the United States Treasury. The federal government’s gold reserves were at a dangerously low level. People started trading in their paper money in for gold and stocks fell rapidly. The prices of silver then plunged, which led to the closure of silver mines, more unemployment and failed businesses. President Cleveland repealed the 1890 Sherman Silver Purchase Act which split the Democratic Party into two factions, nicknamed the "Gold bugs" and the "Silverites". The proponents of monetary silver, were known as the 'Silverites' and those who favored a gold standard were referred to as 'Gold Bugs'. The Gold bugs wanted money to be backed by gold which would increase the value of money and make prices fall. The result of this strategy would mean that less people would have money. The Silverites wanted money to be backed by silver which would decrease the value of money causing deflation. The result of this strategy would mean that more people had money. The Populist Party, not surprisingly, were firm Silverites who believed that coining silver in unlimited quantities would solve the nation’s economic crisis. To end the crisis in the US Treasury, President Cleveland borrowed more than $60 million from financier J. P. Morgan in 1895, the US Treasury reserve finally reached over the $100 million mark and the U.S. economy back on solid ground. The following year the 1896 Klondike Gold Rush in Alaska would start the end the depression and would increase the money supply without turning to silver. By 1896, President Cleveland had virtually no chance of being elected for a third term in office. Many disillusioned Americans, shattered by the financial disaster and government reaction to the protests and strikes, added support to the Populist Party in the hope of winning more power for the people and regulation of Big Business and the unethical practices of the Robber Barons. However, the urban city workers found it difficult to identify with the rural farm workers and preferred to remain within the Democratic Party. The Democrats nominated William Jennings Bryan as their presidential candidate who campaigned on a Populist-inspired platform. The Populist Party and the Democratic Party joined forces and supported William Jennings Bryan against the Republican Candidate William McKinley. The Republicans campaigned against the combined Populist and Democrat party platform blaming Cleveland’s Democratic administration for the depression. William McKinley had a reputation for moderation on labor issues and tolerance toward different ethnic groups that improved the image of the Republican Party with urban city workers and immigrants. McKinley won and assumed the presidency on March 4, 1897 and in 1900 he signed the Gold Standard Act that established gold as the sole standard for redeeming paper money. This final action was responsible for the death of Populism in America but it saw the birth of the Progressive Movement and political and social reforms including the 1916 Federal Farm Loan Act. The following articles will help provide additional facts and information. Interesting facts about Populism in America and the Populist Party are provided in the History Timeline detailed below. The history of Populism in America is told in a factual timeline sequence consisting of a series of interesting, short facts and dates providing a simple method of relating the history of the Populism in America and the and the Populist Party for kids, schools and homework projects. Populism in America Timeline Fact 1: 1867: The National Grange of the Patrons of Husbandry was founded by Oliver H. Kelley in 1867 and became known as the Granger Movement. Populism in America Timeline Fact 2: 1873: The Panic of 1873, aka 'The Long Depression' saw the rise of Populism in America. Populism in America Timeline Fact 13: 1891: The Populist Party aka The People's Party is formed based on the Omaha Platform. Populism in America Timeline Fact 16: 1894: “Coxey’s Army” marches on Washington, D.C. Populism in America Timeline Fact 20: 1997: President McKinley passes the Dingley Tariff. The article on Populism in America provides detailed facts and a summary of the most important events and dates in the history of the United States - a crash course in American History. The following video will give you additional important facts, history and dates about the personal and political lives of all the US Presidents.